The Kinetoscope seems initially an odd choice. This early motion picture viewer was not the first to device to show moving pictures. However it’s development would help drive the founding of the motion picture industry and set standards that are still used in the movies and still photography. But it’s also a story of intrigue, a Scotsman and possible murder…. The kinetoscope is arguably the first commercial device that defines the principle of what we think of motion picture device. A series of still photos pass over light source with a high speed shutter giving the viewer the impression of movement. The only difference is rather than the image being projected and viewed on a screen or wall, you look down at it. We know these devices and later versions of them better as the coin operated peepshows that could be found at the end of the peer or more dubious establishments. Peep boxes exist back to the at least the 15th century showings still scenes and later motion effects. They perhaps had some influence on Christian Huygens. In 1650’s he developed what would become known as the magic lantern. This was effectively a primitive slide projector. As magic lantern shows developed various techniques were employed to give the impression of movement. The big leap came in 1832 by Belgian scientist Joseph Plateau. This He used to stobe motion to create the illusion of movement. This gave rise to the concept that motion could be simulated by a series of still images shown in sequence. In 1878 Eadward Muybridge an English Photographer capture a now famous series of photo of a horse trotting using multiple cameras. He developed a device called a zoopraxiscope onto which the silhouette of the images were put on a disk and projected forming arguably the first motion picture that was projected. We know Edison and Muybridge met and this may well have driven the idea for the Kinetoscope. But Muybridge didn’t create the first motion picture recorded by a single camera. That honour goes to an almost forgotten Frenchman called Louis Le Prince. In 1888 he shot on paper negative film what is now regarded as the first true motion picture. This 2.11 second long sequence was of his family and friends in Leeds, England. Le Prince later developed a movie projector using cellulose film which he aimed to patent around the same time as Edison patented his equivalent. It’s here things get a bit weird. In 1890 Le Prince got on a train from Dijon to Paris. He wasn’t on the train when it arrived in Paris and what happened remains a mystery to this day. It is possible Le Prince either disappeared deliberately or leapt to his death due to financial or other woes. Others think he was killed. One theory is possibly by his own brother over money. However others have raised the possibility that he was killed due to his competing patent to Edison’s. I’m not a great fan of the Edison theory. However Le Prince’s brother Adolphe would be called as a witness against Edison during litigation in New York challenging Edison’s claim to have invented the moving picture camera by one of his rivals. Adolphe was found dead 2 years later when out on a Duck Shoot near NY. Edison passed his ideas & concept onto William Kennedy Dickson his Scottish assistant whom would become one of the key players in motion picture development. Edison had originally wanted to use a rotating drum with tiny images but was later encouraged to change tack to the newly developed nitrocellulose film base first created by Hannibal Goodwin in 1887. It would be this flexible, transparent base that would drive both motion picture and still photography. Dickson is often credited with the decision to cut in half the 70mm wide roll of film from one George Eastman. This created the 35mm wide perforated film strip which remains a staple of both the movie industry and still photography. It was one thing to play back the film on the Kinetoscope but Edison and Dickson had to capture it. To this ends Dickson also developed the Kinetograph film camera. This featured a revolutionary high speed stop and go film movement. This would be a cornerstone of movie cameras until the dawn of TV and video recording. Dickson featured on the 3 second film in the first demonstration of a prototype Kinetoscope. In 1891 around 150 members of the National Federation of Women’s Clubs saw the clip you can see above. In 1993 it was launched and was a massive success for Edison initially. But its demise was swift. 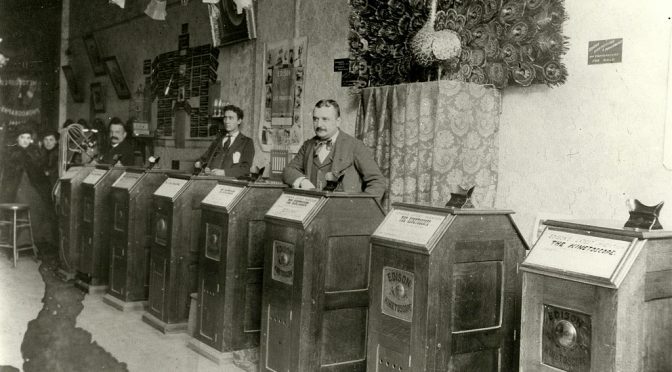 The Kinetoscope was a stop gap until the creation of film projectors around 1895. Dickson left Edison to set up a rival film company. Edison had some success in thwarting his rivals including Dickson by the use of patents. This stopped them using 35mm film, forcing them to use wider and more expensive film. He had failed to however patent internationally which allowed folk like the Lumiere brothers to come. The Patent would be successfully challenged in 1902 opening the flood gates to Edison’s rivals. Sprocketed 35mm film would be up taken by early still camera makers. But it would be a certain Oskar Barnack working for Letiz who gave us the first full frame 35mm camera the Leica I.
Alan, contrary to popular belief, the Leica was not the first full frame, 36×24, camera. This honour goes to the Simplex of 1914. This was not a commercial success, as such, with a very limited production but, historically, it was the first camera able to shoot 36x24mm images. There were, in fact, three models. One for 18×24, a second for 36×24, and the third which could shoot 18×24 and 36×24. The Furet of 1923 also pre-dates the 1925 Leica. What Leitz did, though, was to make a commercial success of the format and the rest, as they say, is history. The Tourist Multiple is, to my eyes, a very attractive looking camera. I’d love one! But even here, there could be an argument that the Multiple was still not the first to use 36×24, as this accolade may even go the the Smith Camera of 1912. So little is known about this camera, that it will be hard to confirm. When we talk about “firsts” we need to be sure about the parameters we are working to. As you point out, even when talking about the 35mm cameras, as there can be noticeable features that differentiate them. For example, are we referring to perforated or unperforated 35mm film? There were some early cameras having a 30x60mm format. Unless one is prepared to accept the sprocket holes impinging into the frame, I’m guessing this camera used unperforated film, possibly single perforation film. That period in history must have been fascinating. Which system should one buy into? Thankfully, Leitz answered the question.